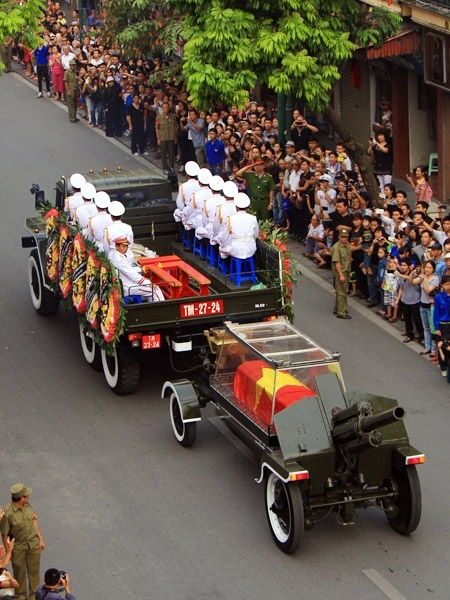 Hundreds of thousands of people bid their final farewell to General Vo Nguyen Giap today, the Vietnamese military reported on its website. As the principal commander of the Vietnamese People’s Army in the wars against France and the United States, Giap was described by US Gen. William Westmoreland as a “formidable adversary.” While Giap’s popularity waned in Vietnam after the death of Ho Chi Minh, he remained a prominent face of the Vietnam War here in the United States. So it’s not surprising that in in 1995, when former US Secretary of Defense Robert McNamara sought out Vietnamese leaders for a conversation about the “missed opportunities” for peace between Vietnam and the United States, Gen. Giap was among the men he solicited. McNamara and Giap sat down in November 1995 and talked, among other things, about the reasons the war began. The American press was on hand to record Giap’s clarification of the Tonkin incident, which was cited by the US as a reason to escalate American involvement in the conflict. Giap said that there was no attack on US ships on Aug. 4, 1964 and that an earlier attack on Aug. 2 was ordered by local commanders, not Hanoi. In one swoop, Giap had destroyed what many in the United States had assumed was our initial justification for war in Vietnam. McNamara’s response was not one of surprise but confirmation. He told reporters that he had long thought the second attack was dubious and Giap’s comment had merely settled the debate. 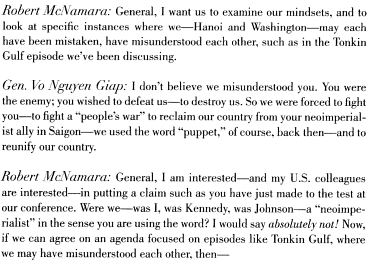 Would the Vietnam-US war have been avoided altogether if Giap and McNamara had this conversation 30 years earlier? McNamara has often asserted that the war which so marred his name was due to “misunderstandings” by both the Vietnamese and Americans. Through better communication and attempts at understanding, McNamara hoped that he can not only resolve the controversy surrounding Vietnam but prevent future wars. War is never that simple, however. De-classified documents and recordings from that early period suggest that the White House had already decided to escalate the war before the second Tonkin incident was even reported, so it is unlikely that rectifying the US’s mistake about Tonkin would have changed the course of the US. Further, as anyone who has ever argued with a friend about politics knows, dialogue does not inevitably lead to a shared worldview. 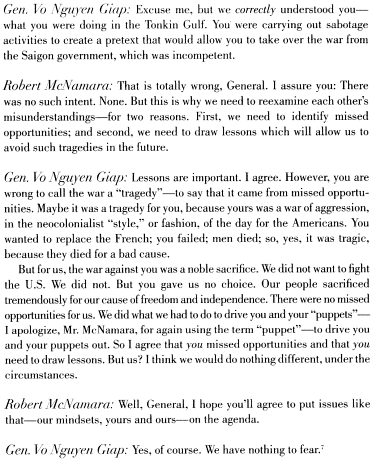 In his book “Argument Without End: In Search of Answers to the Vietnam Tragedy,” McNamara shared part of his 1995 conversation with Giap. It is clear how different their thoughts on the causes of the war and so-called misconceptions are. They would make two discoveries in the dialogue that ensued: first, that their view of the US mindset and motives was wrong; and second, that their misunderstanding of the US mindset and motives may have led the Hanoi government to take actions that, in retrospect, were mistakes, which led to missed opportunities, and which contributed to the tragedy of the war we fought. So who was right, Giap or McNamara? Most historians would probably say neither or both. The US was not a colonial power in the same way that France was, but some of its actions in the South had a similar bent. Yet, neither McNamara nor Giap could see the world in such a nuanced fashion. In the conversations McNamara has with the Vietnamese, he seems to be on a self-righteous mission to set the facts straight. History has not treated the US role in the Vietnam war well, and Giap is eager to add salt to the American leader’s wounds. While their conversation illuminates their entrenched positions three decades on, it does not accomplish much in terms of improving relations. Dialogue, argues German philosopher Hans-Georg Gadamer, requires a person to first admit that they are biased and then to respect the bias of the other person. Through this process, participants may finally reach a “fusion of horizons,” where parties merge their perceptions of a situation to create a new, third perspective that incorporates elements of both viewpoints. 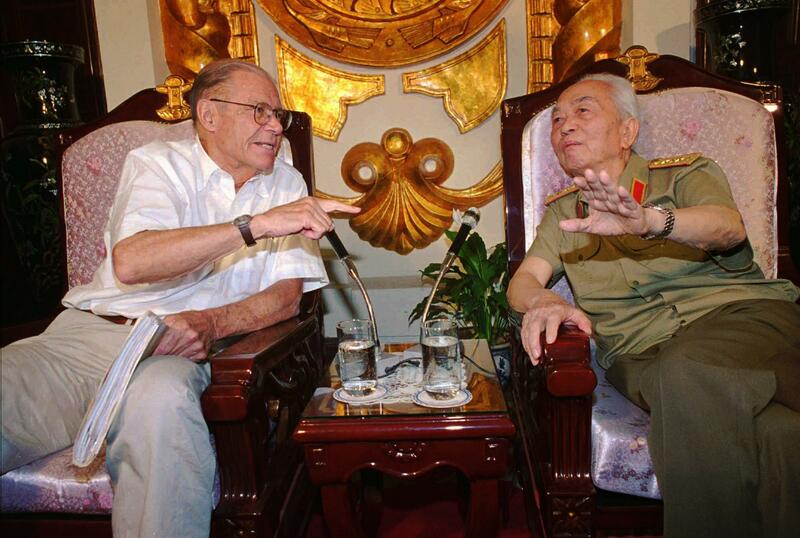 It is a pity that Giap and McNamara could not reach this shared understanding before their respective deaths.